British Railways Standard 4 2-6-4-T No. 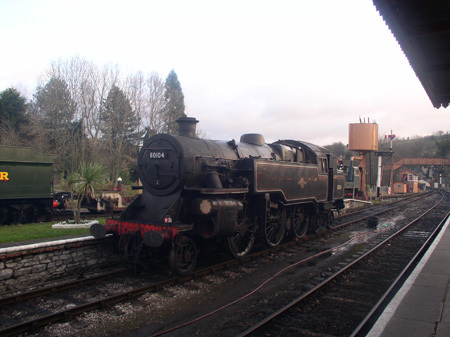 80104, from the Swanage Railway has arrived at Buckfastleigh for winter work to be carried out. Work to be carried out is mainly an axlebox overhaul although additional jobs may be done. The engine arrived on Friday by road and is seen parked in the run round loop at Buckfastleigh awaiting movement in to the loco shed on the afternoon of 14th December. Now, here's a question! Which Standard 4 tanks have been to Buckfastleigh since the SDR took over running the line from Dart Valley in 1991?